The sharp division of pre-war housing from post-war accentuates the contrast between Patcham and its eastern neighbour, Hollingbury. Post-war Hollingbury, with its prefabricated Carden School may be seen in the first photograph here. 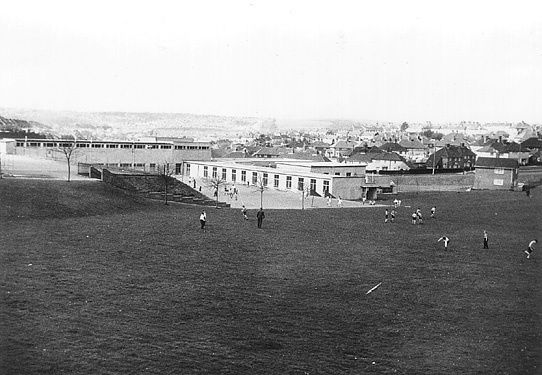 The second photograph illustrates that fact that Carden School has substantial playing fields around it. 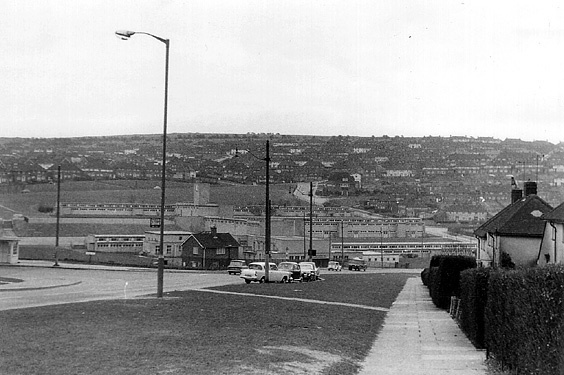 Playing Fields, Carden School, Hollingbury c.1960. My father went to Carden School many years ago, now 3 of my daughters have also gone through there and loved every minute of it. My youngest daughter is still there and getting great pleasure from the school and all the staff that work there. I feel that the school has a fantastic atmosphere and has great teaching methods and I will be sad when my daughter eventually leaves. Well done, Carden; it has been given a good lick of paint but it still has the character of the old school. Long may Carden continue. I went to Carden School for a short time in 1952 and took part in a school sports day and beat not only the girls but also the boys in the sprints! Later in my life I equalled the British 100 metres sprint record for my age. My inspiration must have come from that day in Carden School! I went to Carden Infants until I was 8 back in 1980. I always thought the school looked creepy and was happy to move away. I remember being scared of Mrs New and that we had a lady head mistress. I lived opposite Carden School and have great memories of living there and remembering my time at the school. I left Carden School in 1970 and moved to Australia in 1974. You can take the girl out of Brighton but you can’t take Brighton out of the girl. More than 30 years on I am always looking at things to do with Carden School and Brighton. I still go to Carden now! I love it and in a couple of years when I leave I will be very sad. Carden is an amazing school and all of the teachers are lovely. Lots of things have changed and there are lots of events coming up this year. Everyone is lovely and the head and deputy teachers are very nice. We sometimes have ‘no school uniform days’ to raise money for charity and everybody brings Fifty Pence! Yes, I left Carden in 1969 and have fond memories of it. Emmans, the headteacher and Mr Kitchen, deputy head and Mr Deadman playing piano in assembly. Hi Monty, Ray Cook here, just seen your letter re Carden school. The last time i saw you was in the pet shop shop in Wilmington Parade. I would like to correspond with you about “regent” Bob,Grahame days, go Monty i dare you. Hope to hear soon . I loved going to Carden. I left there in 1969 and remember the same teachers as Paul Rawlinson. I think I was in the same class as Paul. Does anyone remember the small outdoor swimming pool that we had? Yes, a small blue pool on the patio outside of what was then class 1m. I’m glad Paul remembered the pool. Everyone else I talk to think I was imagining it. Paul, was I in your class? Used to be Caroline Frost and lived in Denton Drive. I love Carden School and I love all my friends and all teachers are very nice: “TEAM CARDEN”. To Caroline Frost: yes, we were, 2/1 Mr Deadman, 3/1 Mrs Allen (wouldn’t take us on a school trip because someone upset her), 4/K Mr Deadman. And of course people like Willie Maskell, Jane Rees, Carol Butcher, Tony Mackey, Sue King(? ), Stuart Pilbeal, Debbie Rider et al. I still go to Carden now! Carden is a brilliant school. This year, when I leave to go to Patcham, I will be very sad. I have been at Carden for 8 years of my life and so far it has been great! Sometimes we have a ’non-school uniform’ day to raise money for charity and we have to bring in fifty pence. Carden is Great! I went to Carden Infants School in 1948 and continued on into the Junior School. The headmaster was Mr Ede and some of the teachers I remember were Miss Colbutt (or similar), Mr Cheeseman, Mr Kitchen, Miss Palmer. I have fond memories of the place. I made a comment on August 13, 2010 about Carden School that I attended in 1948 when it opened. I said that the school was opened by Mr Chuter Ede as Minister of Education. In fact it was opened by the Minister of Education, but his name was George Tomlinson. There was a prominent Mr Ede in all this but he was the Junior School Headmaster, and his first name wasn’t Chuter. Chuter Ede was the UK Home Secretary at that time. Apologies! Am I dreaming? Was there a pond /lake behind Carden School where the factories and park are now? I seem to remember playing there on a old oil drum, with my old friend Micky Tilley getting soaking wet. I went there in 1952 – good days. Thanks Roy for putting my mind at rest. Actually I was there in 1951. Drove past there the other day, it has not changed a bit. I loved Carden School. I remember I was gutted when Miss Palmer married Mr Cheeseman, and being put on the girls’ side of the playground for being naughty. Hollingbury was great to grow up in. Is that Alan Clarke with brother Brian used to live opposite in Carden Hill? Hi Jamie. Yes we did live opposite. Brian has lived in Tasmania now for the last 40 odd years. I can rememeber Carden Hill with only one car in it that used to belong to Mr Lawrence the insurance man. We were allowed to sit in it on Sunday mornings. Oh what lovely memories! Hi Alan. Is that the Mr Lawrence who worked for the Pru? I had no idea he lived in Hollingbury. I remember him coming down Rotherfield and fascinating all us kids with his magic tricks, eg suddenly producing a half a crown piece from behind someone’s ear! One car only. Mmm, I recall those days too. Lot’s of space, eh? I went to Carden School in 1952 and remember having sleeps outside on a little camp bed on the concrete outside the classrooms and in direct sunlight as they wanted us to not get rickets! I can remember the long corridors and they seemed endless trying to get out to see my mum at the end of the day. I spent 7 years there and as I got older we used to go over the road to the shops and buy broken biscuits. I remember there was a barber/hairdresser in the same parade of shops and when I was older I did a paper round from the newsagents there. We used to go to the County Oak pub, they had a little hatch where we used to buy a bag of Smiths crisps with a little bag of salt in a blue wrapper (things were so simple then!). I lived in Carden Hill and remember Mr Lawrence coming every fortnight to collect the insurance money. I also remember the rag and bone man coming on a Saturday morning early and waking me up! And the onion man – not sure how often but he came from France with strings of onions around his neck on a bike! When it snowed we used to go out on a sledge my dad made, on the slope from Carden Hill going down into Hartfield Ave (narrowly missing the twitten) that took you into the road below (can’t remember what it’s called). I used to have to walk up Carden Hill to the petrol station at the top with a can to get it filled up full of paraffin cos that’s all we had, a paraffin heater to keep warm and there were icicles on the insides of the windows. I remember the trolly buses, they were always breaking down cos the arms would come off the rails. Hi, I wrote the last blog a couple of years ago (just signed Heather). I remember Sandra Baldwin – I used to work with you at Miss Selfridge, I loved going to Carden School does anyone remember the Lady that saw you safely across the road in Carden Hill? I think her name was Mrs Claverly, she was lovely. Hallo Heather, I remember your name very well but have no conscious memory of our working in Miss Selfridge at the same time. Please help refresh my memory. I also remember our Lollypop Lady at Carden School as very warm, friendly, and protective. Lots of lovely blonde hair and a big smile. Mrs Claverly or Cleverly. Hi Sandra. Yes we worked with Lucy, Rita who’s married to Terry, Mary, Jill, who worked upstairs who went to live in France, Sheila, who I still see, Ronnie, and Sheila did the windows. I had long blonde hair.We had a Scottish manager and there was a security lady called Diane. I’ve got a photo with you and me in it when we worked there. Does anybody know what kind of shop was on the corner of the parade of shops along Carden Parade? It’s inbetween the Chinese takeaway and the trophy shop but it’s been closed for ages. Heather. Your memories of sledging down between Carden and Hartfield brought back the terrifying memory of me going down that twitten following a night when the slope was watered and allowed to freeze. I think it was the son of Police Seargent Cavey who lived on the side. The road down is Lyminster Avenue. I am sure that the shop referred to above was a hairdressers; the last Kellys Directory in 1974 shows it as a ladies hairdressers, but later I am sure it was a gents barbers. In the 60s, Tracey, the shop on the corner was a hairdressers. In fact, I think I can remember all the old shops from back then. What is now the Chinese takeaway, was then a fish and chip shop. Next, in order: hairdressers, chemist, bakery (delicious lemon cream puffs! ), butchers (nice sausages), Larters the grocers, greengrocers, then newsagent/post office (as now). The last shop in the parade varied in use. I’m sure it was once a launderette, but I also remember it as a clinic where us kids had our inoculations. Yes, I remember the children sliding down the slope between Carden Hill and Hartfied in the snow. My four children used to take my tea and baking trays to sit on to slide down the hill. All four of my children went to Carden and four grandchildren. We have seen a lot of changes over the years but I think it is one of the best primary schools in Brighton. Is Janet still in the nursery class? Yes there was a barber/hairdresser on the corner of the shops. It was where I got my first fringe cut. The grocers used to sell broken biscuits for a penny. I remember going with my mum to the church in Lyminster Ave to get the government orange juice which was lovely. Yes Alec McLean the police officer that lived there next to the field where we sledged was called Cave but am not sure of the children’s christian names though. The shops in were fish/chips (rumour had it the owner died from choking on a fish bone). Louis the hairdressers (men/women), chemist, Nichols the bakers (lardy cakes second to none), Southerns the butchers, Larters the grocers, the greengrocers(name escapes me), Osbournes the newsagent and on the end of the parade was the council rent office. l lived there from 1948 and went to Carden school in 1949 and the headmistress of the infants was Mrs. Budleigh and her husband was headmaster of Patcham seniors Nick, named Bertha (no offence), hopes this helped. My wife, then Diana Bentley, went to Carden about 1952 and then went on to Patcham after about a year. She lived in Carden Avenue off the new (then) service road. I was educated mainly in Patcham “Academy”, in the Seniors under Mr Budleigh who taught me violin! I was in the Boys’ Brigade and we used to “parade” in the hall of Carden School under our Captain Bumbles Griffin and Lieutenant Les Harris who was a coal merchant. The last shop in the parade of shops was a launderette before being a council rent office. @ Heather Fill. Your post on 25/9/2012 was so interesting, it could have been me writing it. My time was a little later, mid late 60s, but nothing had changed. I lived on Denton Drive, I cannot believe what they are selling for now, out of this world! Everyone pulls a face when I start off with “I remember when I would scrape ice of the inside of the bedroom windows”. I would also walk down the grocers in the parade of shops to pick up the paraffin, we also had coal delivered. I would also sledge down Carden Hill on those snowy days, didn’t feel the cold then! I would go the the County Oak Pub and pick up all those goodies and I think I was allowed to cigarettes for mum at the off-license. Insurance man would come around each week and who could forget the pools man….LOL….Nice to know it was not all a dream. The Hairdressers shop was called A,Louis I seem to remember , my mother would take me there for a haircut after school ,children used to sit on a special board over the arms of the seat to get to the correct height , we always called the owner Mr Louis but I think he was actually Mr Mussard, Louis being the Busineess name. In the later 60’s his son took over his name being Alan Mussard who was into the Hot Saloon cars of the time . The building next to the News agents used to dispense the bottles of Orange Juice and Cod liver oil and malt to keep us youngsters healthy ! And as well as the board on the barber’s chair, there was a leather strop hanging off the back for sharpening the cut throat. Heather (nee Worral): Hello, I actually left a message on the site that just had a comment from you and with your Christian name only and I know that it has gone on but have failed in trying to re-find it today and have come across this one! Anyway, it basically said that, yes, I remembered all you commented on and lots more beside and suggested that you look at a couple of the sites that I have written comments on. If you go in on my Brighton and Hove by Rosie Roser you will find one entitled ‘A trip down memory lane’ and one with a class photo taken in 1953. If you’d like to leave a comment on either of those, I would be thrilled as I am sure that now I know your surname (maiden) that I knew you!! Was your Dad a policeman as mine was? You mentioned the Cave family. I too can’t recall the children’s names but my Dad and Jim Cave were great friends. I’d love to hear from you. Rosemary (nee Tullet) Roser. I have used and enjoyed the Carden sites so much I would like to make a donation so please would you let me know how to go about this? Hello. Go to the home page and on the right hand side is a picture of a pile of gold coins – click on that and you can make a donation. And thank you! Editing Team. In 1951 we were allowed to move into a newly constructed council house. I was very much out of my depth, the teaching methods were totally different as I remember. I had to sit the 11+ exam but, because of the terminology, I did not understand many of the questions, even in my best subject Arithmetic where the questions were asked in words and not symbols eg ‘add’ instead ‘+’. However, my new senior school was Patcham, Class 1B. I have a class photograph which I think was my first class at Patcham. We too walked to school in all weathers. Sorry to say that we (Old brigade in the early days) are gradually being depleted we lost Billy Mac a while back and have just received news of Alex Williams passing away in Canada, he was a great lad with a smile to match.